Now that Summer is almost over, it's time to prepare for the Winter Holidays! You might say that you still have plenty of time but it's really just around the corner. To have holiday greeting cards available to you by Thanksgiving weekend, we are currently scheduling family photo sessions starting September 15, 2007. Please take advantage of our holiday photo session promotion and discounts. 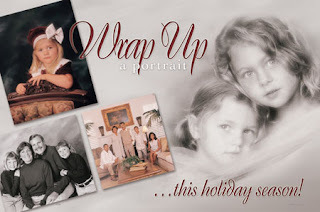 You'll save a bundle of $$ and at the same time capturing a special family portrait and preserving it forever. Kids grow up so fast. In a blink they're grown and off on their own to college, pursuing a career, starting their own family. Special moments like these only happen once in a life time. Wouldn't it be great to preserve these moments forever by having top quality photos framed and placed on your mantle, bookshelf, desk, etc. Give us a call today! Our limited promotional photo packages are filling up very quickly.